FAYETTEVILLE, Ark. 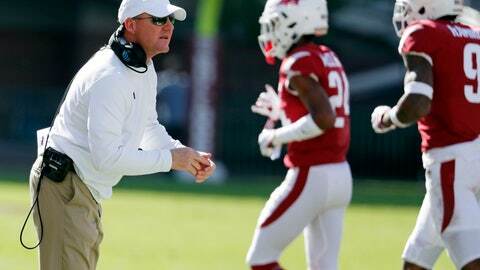 (AP) — Arkansas defensive backs Ryan Pulley and Kamren Curl have been suspended for the season finale against Missouri for socializing with members of Mississippi State’s spirit squad. Arkansas coach Chad Morris announced the decision earlier this week. Pulley and Curl were seen with the Mississippi State students before last Saturday’s 52-6 loss in Starkville. Morris called the actions “unacceptable” during his postgame remarks. Arkansas’ secondary already was short-handed. Cornerback Jordon Curtis escaped serious injury after he was struck by a car while leaving practice Sunday. Morris says Curtis was treated and released from a hospital, but he won’t play against Missouri. According to a police report, Curtis suffered a wound above his right eye after he was struck by a car in a pedestrian crosswalk near the Fred W. Smith Football Center. The driver was cited for failure to yield to a pedestrian and driving too fast for conditions. Missouri isn’t an ideal team to play with a depleted secondary. Tigers quarterback Drew Lock ranks second in the Southeastern Conference in yards passing and passing touchdowns.